A GQL Quilt Care Label sewn to a back corner of this quilt, plus the identification label, may help it be valued and taken care of by future owners. Photo by Barb Gorges. We quilters are regularly reminded to label our quilts or to at least embroider our name and the date in a corner. We’re more likely to do it if we are giving the quilt away. It seems silly if the quilt is the one I’m using every night or that hangs on my wall. But seriously, it’s hard to know when you and your quilt may be parted. It’s better to make signing your quilt a regular step in your finishing process. Labels are nice because you can add more information about you and the quilt using fine point permanent ink. Or use a computer and printer to print on fabric. Some of the information you may want to include is: your name, the date, your location, name of the quilt, size, pattern, inspiration, and the occasion for making the quilt (wedding, baby, graduation, etc.). Maybe add a note about fiber content, especially that of the batting. Don’t forget to add the name of the quilter if it wasn’t you. On quilts that will be exhibited, I also put my address and phone number. If you’ve ever had a vintage quilt appraised, you know it is more valuable if there is information about the quilter and the quilt, so label your quilts for the sake of your heirs—and to impress them with the value. Perhaps it will help them treasure your quilts more. In addition to quilt and maker information, it’s good to have quilt care instructions. Thirty years ago, I was making lots of quilted pillows and placemat sets (hand quilted!) for friends and relatives getting married or graduating and I was pretty sure they didn’t know how to wash quilted things safely. I made “hang tags” out of cardstock, writing out washing directions and pinning them to the gifts. You can imagine as soon as the recipient unpinned them, the directions were not filed by the washing machine. So I started printing brief care directions at the bottom of each label. Printing with permanent ink on fabric, no matter how fine the point, takes a lot of room. But one day I said “Eureka!” when I realized a solution had already been invented. Care labels are in all of our clothes and linens. Why not make the same kind for home-made quilts? My realization and subsequent research took place in 1998. Using a directory of manufacturers, I was able to find a company that could weave a 3 x 3-inch taffeta label with the basic quilt care information I thought was necessary: cleaning, display and storage. I was going to make some just for me, but there was a good price break at 10,000 and I thought I might sell some to other quilters. I have since sold more than 60,000 Gorges Quilt Care Labels—in all 50 states and a few other countries. I have loyal customers who buy a package of a dozen at a time. But I am surprised the labels don’t sell better. Part of it is I can’t afford glossy ads in magazines for an item that sells for so little. Part of it is that I’m selling something quilters don’t need until they finish a quilt. And you know how many unfinished quilts we all have! Part of it might be that a quilter has read the care information on the label, but doesn’t agree it is the best information. But actually, I think quilters have faith that the person receiving the quilt will know how to take care of it. Really?! I just heard another horror story during Quilt Wyoming 2014 about another handmade quilt inadvertently ruined by the recipient. 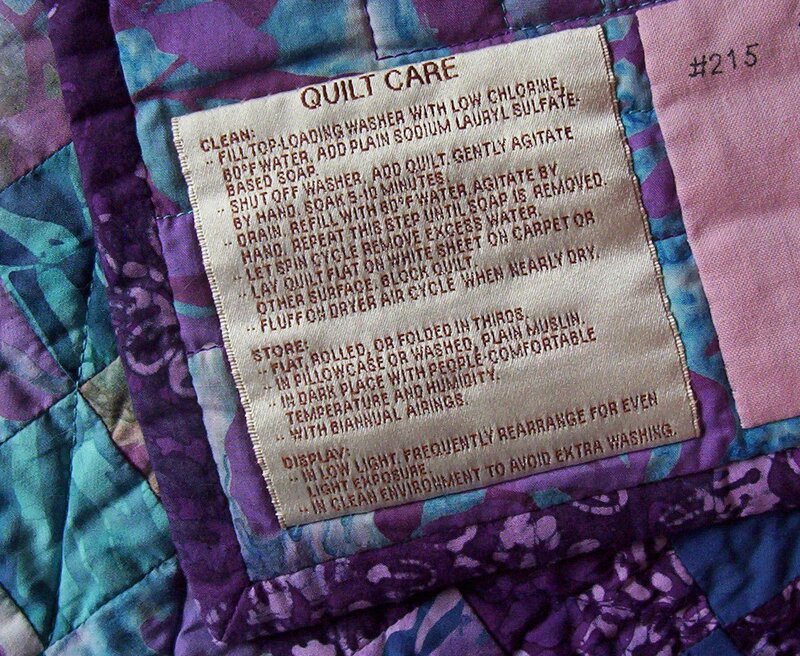 Most of my customers are putting the quilt care labels on quilts they give away. But why not put them on quilts at your own house? Remember, some day you may not be there to protect your quilts. Even if you are still alive.